Kenn Cockrell is President & CEO of Hinds County Human Resource Agency (HCHRA), in Jackson, Mississippi – where he has worked since June 17, 1985. In addition to extensive executive management experience, Cockrell has Bachelor of Business Administration from Jackson State University and has done graduate studies in Public Administration and Public Policy at the University of Georgia and Jackson State University respectively. As CEO Cockrell oversees 400 employees spread from the Agency’s Central Office in Jackson to 16 Head Start and Early Centers located throughout Jackson and Hinds County. For information about HCHRA and/or the services provided, call (601) 923-3930. As President & CEO of one of the largest Community Action Agencies in Mississippi, Kenn Cockrell has a wealth of knowledge and experience. Starting as the Director of Planning & Evaluation, Cockrell learned every aspect of the business and within eight years was chosen by the Board of Directors to run the organization. A firm believer in community involvement, Cockrell served on numerous boards including Leadership Jackson Alumni Council, Middle Mississippi Girl Scouts Council, Retired and Senior Volunteer Program, Mississippi Center for Non-Profits, Mississippi Families for Kids, and Central Mississippi Literacy Council. He also has memberships with several organizations such as the National Community Action Foundation, Mississippi Association of Community Action Agencies, and the Mississippi Conference on Social Welfare. During his tenure as the CEO of Hinds County Human Resource Agency, Cockrell has taken the Agency from a small operation to one with a multi-million dollar budget. 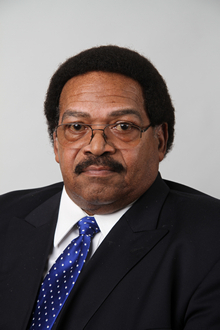 From 2001 through 2016 (15 years), he has served as President of the Mississippi Association of Community Action Agencies (MACAA) – further testament to his level of knowledge and experience. Yet, he understands that without community support, there is no community action. In the midst of an ever-evolving economic landscape that is often challenging to maneuver, Hinds County Human Resource Agency has maintained the ability to provide quality service for the citizens we serve…and we’ve done so because of our community partners. They show how much they care by sharing their time and resources to ensure that we continue to provide quality service. Over our more than 40-year history, thousands of Mississippi residents have benefitted from the many programs and services we offer. I shudder to think about what would happen to our many neighbors and loved ones, if this agency did not have community support. Generosity makes a difference in people’s lives every day. While this Agency has accomplished much, there is still much to do. Until poverty is eradicated, Hinds County Human Resource Agency will continue…Helping Families and Strengthening Communities.